I spatchcocked (yes, that is a valid verb, I checked) a chicken last night and decided to try roasting some cauliflower at the same time. But then I realized that chicken is white and so is cauliflower, which would lead to the dreaded monochromatic plate! What was I to do? Well, I had some red cabbage and figured that it couldn’t hurt to throw some in there for color. And what do you know, it was great! I will probably be doing this every time I roast a chicken because it only takes a few minutes to prepare, the chicken and the veggies are done at the same time, and they roast at the same temperature. Also, it turned out to look really appetizing. In a large bowl, break up the cauliflower into small bite-sized florets. Lay your cabbage flat side down (it should have a flat side after you’ve cut it to be a half or quarter) and slice it about 3/4 of an inch (2 cm) wide, then cut the resulting long strips into thirds. 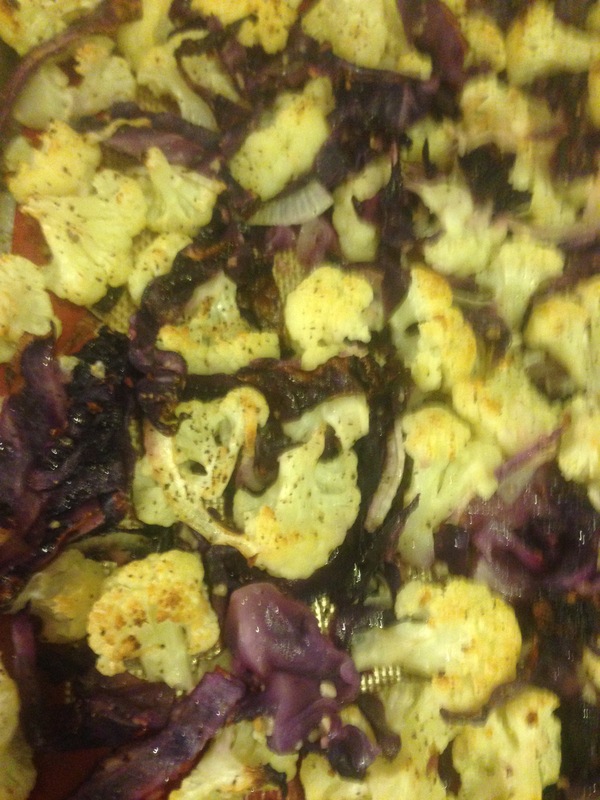 Break up the sections that will be stuck together as best you can, and add the cabbage to the cauliflower. Slice your onion as thin as you can. I used a mandolin to get slivers. (I have a Benriner and am very happy with it.) If you end up with slices, as I did, cut across them in an X to break up the rings, and add them to the cauliflower and cabbage. Add the minced garlic, olive oil, and some salt and pepper to the bowl and mix everything well. Just use your hands. Pour everything into a large baking tray and spread the vegetables out evenly. I already had a silicone mat on my tray, so I used it, but I really don’t think it was necessary. Try to get everything in a single layer, or as close as you can get to a single layer. This is important. Do not crowd your vegetables when roasting or you’ll end up steaming them instead. I’d be willing to bet that you didn’t add as much salt as will be needed when you were tossing everything in the bowl. 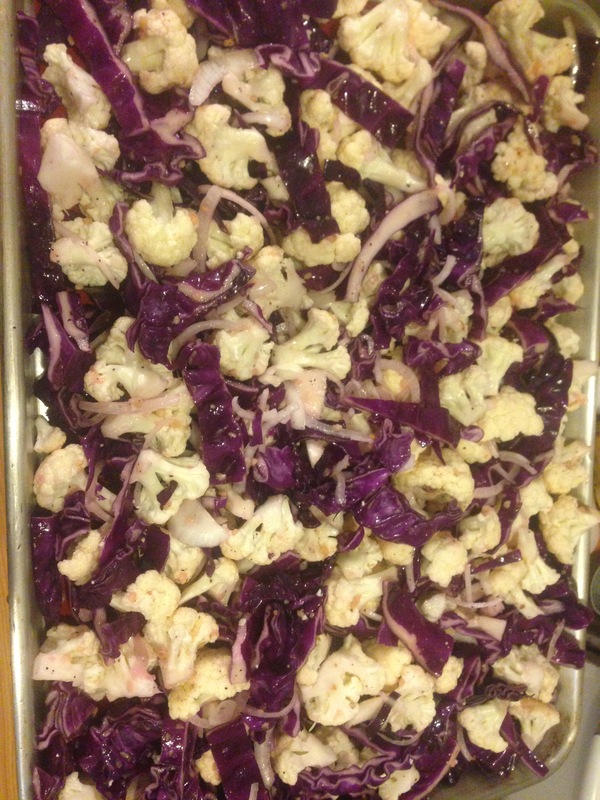 Cabbage takes a lot of salt to taste seasoned, so sprinkle more salt and pepper over the entire tray. Roast in the oven for 30-40 minutes. When it’s done some pieces should be browned on top, and the vegetables should be tender but not mushy. Taste for seasoning and probably end up adding some more salt. If you don’t need more salt, kudos to you for being a better judge of seasoning than I. If making this with a spatchcocked chicken, put the tray in the oven when your chicken timer has about 35 minutes left and they should get done about the same time. Sorry the quality is so fuzzy. By the time I’d realized it wasn’t a clear photo, the food was already devoured.